Northbrook’s Nick Hardy is going from one big event to another. 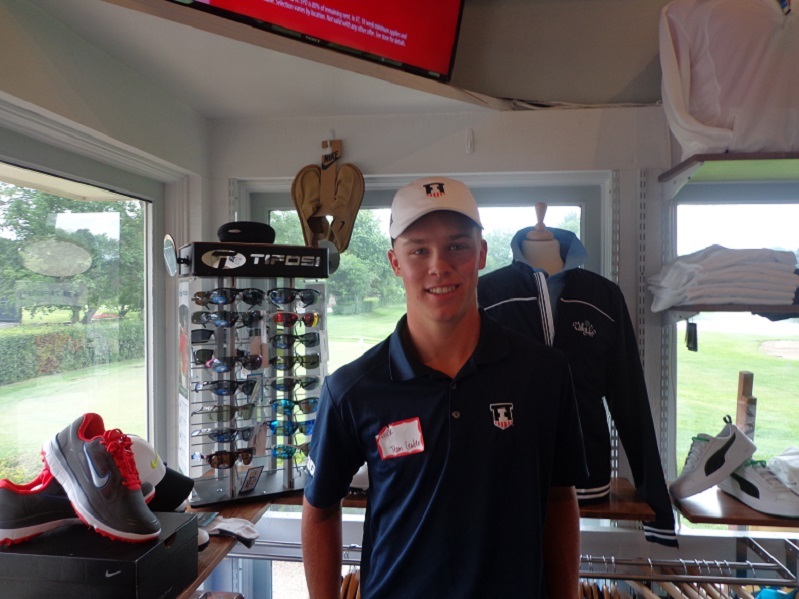 Just 10 months ago Northbrook’s Nick Hardy was shaking off a loss in the final of the Illinois State Amateur and getting ready for his freshman year at the University of Illinois. This week, at 19, he’s playing in the 115th U.S. Open at Washington’s Chambers Bay course. Hardy won’t be the youngest player in the year’s second major championship. That honor goes to Cole Hammer, a 15-year old high school freshman from Houston. Hammer is the third-youngest player ever to tee off in the Open but Hardy is more battled-hardened. He blossomed as a freshman for coach Mike Small’s Illini, sharing the Big Ten individual title in May and helping his team finish on top of the leaderboard in the stroke play portion of the NCAA tournament. Small put Hardy in the crucial No. 5 position for the match play portion, and he came through with the victory needed to get the Illini through to the semifinals. His team’s season ended there, but Hardy wasn’t done. He – along with senior teammate Brian Campbell – survived last week’s sectional qualifying for the Open. The U.S. Open is, of course, a different animal than playing with the college guys. The best players in the world are at Chambers Bay. That first tee shot comes on Thursday. His practice partners at Chambers Bay included Campbell, who also qualified last year, and PGA Tour veteran D.A. Points, an Illinois alum. This year’s Open had 9,882 entrants from 75 countries, and 156 will tee off at Chambers Bay. Fifty-eight earned their spots in 12 sectional qualifying tournaments. Hardy additionally had to survive an 18-hole local qualifier to play in the sectional. Only two Open champions – Ken Venturi in 1964 and Orville Moody in 1969 – came through both local and sectional eliminations to win the title. In last year’s Open at Pinehurst, N.C., 25 of the 156 starters were survivors of both eliminations and five of them made the 36-hole cut. This is an extraordinary U.S. Open from a Chicago area standpoint. Other sectional qualifiers include former world No. 1 Luke Donald, who has played in every Open since 2005; Points, a three-time Illinois State Amateur champion; Glen Ellyn’s Andy Pope, a Web.com Tour player who was the Illinois Junior Golf Assn. Boys Player of the Year in 2001; and Hoopeston’s Michael Davan, who was the Chicago District Amateur champion in 2012. Davan, like Hardy, qualified for the Open in a sectional at Springfield, Ohio. Davan was the medalist there, shooting 65-67 for the 36 holes. Davan, a 26-year old pro, has been playing on golf’s many mini-tours. Until the sectional he had been one frustrated golfer, missing seven Web.com Tour events as well as the PGA Tour’s John Deere Classic by one shot in qualifying tournaments. In addition to the unusual large contingent of local players the tourney has another Chicago connection. Chambers Bay is managed by Northbrook-based KemperSports. Illinois’ Campbell is one of four sponsor invites for next month’s John Deere Classic. Others are college stars Bryson DeChambeau of Southern Methodist and Lee McCoy of Georgia, both U.S. Open qualifiers, and former No. 1-ranked amateur Patrick Rodgers. Rodgers is getting his fourth sponsor invite to the JDC. Three winners of major championships – Larry Nelson, Hal Sutton and Lee Janzen – have entered next month’s Encompass Championship at North Shore in Glenview. So has D.A. Weibring, a champion at both Illinois PGA events (former Western Open and JDC). Twenty-three of the top 30 on the Champions Tour money list have committed to play in the tournament. KemperSports will host the Chambers Bay Challenge at all its member courses during the U.S. Open. Players making a hole-in-one can receive a trip to Chambers, where they’ll get a shot at $1 million on the No. 17 hole.